Artwork from Fiber Artist and Doll Maker, Paula McGee. Fiber artists come together to form an eclectic mix at Fleece ‘N Flax at 51 Spring St. Eureka Springs, AR. All month long, Fleece ‘N Flax will be featuring local fiber artists. On May 7th, “Art in Sheep’s Clothing” features artist Vicki Hardcastle of Hardcastle Folk Art. May 14th features Fiber Artist and Doll Maker, Paula McGee (artwork pictured right). On May 21st, its all about weaving with featured artist is Debbie Davis of Red Scottie Fibers Studio. 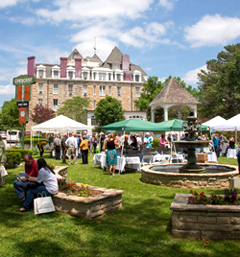 The Books in Bloom Literary Festival is a Celebration for both Writers and Readers! For a decade, this amazing festival, started by the Carroll and Madison Public Library Foundation, has promoted the value of books and reading. The Festival provides an opportunity for the public to meet authors and to hear them speak about their work and various aspects of writing and publishing. Located on the grounds of the Crescent Hotel, this FREE event is from noon to 5 pm, Sunday, May 15th. Click Here for more information. 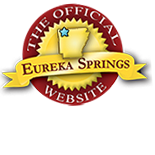 All month long, visual artists from Eureka Springs will be paired with several of the city’s finest restaurants to display works by the featured artists. The month long exhibits will include receptions in the restaurants honoring the artists on various weekends during May. Various restaurants around town, including DeVito’s of Eureka Springs and The Grand Taverne at the Grand Central Hotel. Click Here for more information. Eureka Fine Art Gallery, 2 Pine St.
Iris at the Basin, 8 Spring St.
JA Nelson Gallery, 37 Spring St. This entry was posted on March 18, 2016 by service424 in Arts & Culture, Crescent Hotel, Festivals, Fun Downtown and tagged art, artrageous, downtown, festival, Fleece 'N Flax, May Festival of the Arts, walk, white street studio walk.